Heather Burke of Kennebunkport Maine received a 2018 national award for her travel journalism. 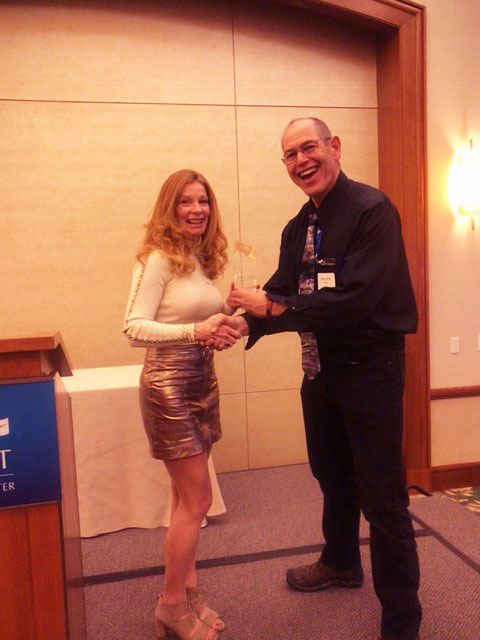 NASJA, North American Snowsports Journalist Association, awarded Heather the NASJA Mitch Kaplan Award, honoring persons who have contributed to the advancement of skiing and snowboarding, demonstrating excellence in media relations, bringing commitment and dignity to journalism. The award was presented in Lake Tahoe, California, at NASJA’s annual meeting, coinciding with The U.S. Ski & Snowboard Hall of Fame and a Legends of Skiing reunion, and at the Boston Ski Show. Heather and her photographer husband Greg manage the websites theluxuryvacationguide.com and familyskitrips.com, and are major contributors to snowpak.com. Their works have appeared in scores of outlets including Boston.com, Forbes Travel Guide, Marina Life, Snow Country, Liftopia and newspapers like the Boston Globe, The Maine Sunday Telegram – where Heather wrote the ski column for 11 years, Montreal Gazette, Providence Journal, Burlington Free Press and more, with her husband Greg’s photography accompanying her articles. Heather, who learned to ski at the age of three at Gunstock in New Hampshire, worked at her parents’ Smugglers Notch Vermont ski lodge, and as a ski instructor before embarking on her writing career. 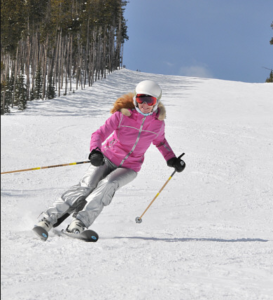 She has been a ski journalist for over two decades, sampling over 170 ski areas and gathering many awards along the way including three NASJA Harold Hirsch Excellence in Journalism Awards, and Freeskier Magazine’s “Top 100 ski industry people to follow” honor. 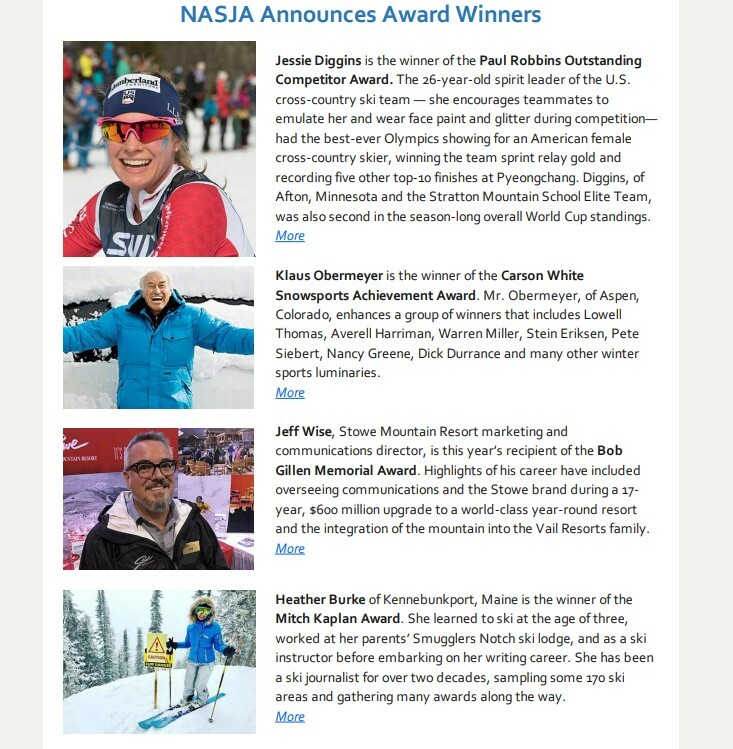 Klaus Obermeyer of Aspen Colorado, Nordic Olympic Gold Medalist Jessie Diggins, and Jeff Wise of Stowe Mountain also received awards at the 2018 NASJA media event. Previous winners of this NASJA award include The Weather Channel’s Jim Cantore and extreme skiing pioneer Dan Egan. NASJA, founded in 1963 as the United States Ski Writers Association, is North America’s largest association of professional snowsports writers, authors, photographers, videographers, broadcasters and industry professionals.